Arrived very quickly. Well packaged. Nice King size that actually allows for adequate drapase on both sides of the bed. The Brookside Down Blend Comforter uses nature's most sophisticated insulation to retain warmth while remaining light, breathable, and appropriate for year-round use. Box stitching ensures consistent loft and breathability, while its edges are piped and double-stitched for lasting comfort. Take your comfort one step further with a matching duvet cover easily secured to the convenient corner loops. This comforter is the perfect weight. I love the corner straps that allows my duvet cover to tie to it and keep it in place. My pet peeve with previous comforters is when the comforter would slide inside the duvet cover and bunch up. The new duvet cover I bought was from a high end store and it had the inside ties built in. This was the only comforter I found that match the duvet's size, had corner straps, was feather and down, and that was priced right. It is dreamy to sleep under. Highly recommend and fits my oversized king mattress nicely. Great size. Love the comforter; however the "California King" size did not fit my oversized king bed. It fitted okay lengthwise, just had an issue with the width. About 6 inches too short. Keeping the comforter for my queen size guest bed. Overall nice soft bedding and I would purchase again. Price was great and received order in two days. This comforter is the best of both worlds! It is light and fluffy but very warm too. When I opened the package it was very thin, so I thought it wouldn't be warm at all, but in a few minutes if was fluffy and perfect. It has the look and feel of the luxurious expensive brand but costs much less. We tried it out for our Sunday nap and I can't wait to use it this fall, its still too hot here for anything but cotton! I am in love with this comforter, it's not heavy at all and keeps you warm. It's made of great quality and the feathers stay in place with the stitching. You can use it as a regular comforter or a duvet, either way it looks and feels AMAZING! Love this comforter! It is truly oversized. Nice and warm. I will not use a duvet cover with it as i like the look of a bright white comforter. This fits the bill perfectly. When I first took it out of the package it seemed thin and I was worried it would not stand up to cold winter nights. I was wrong! 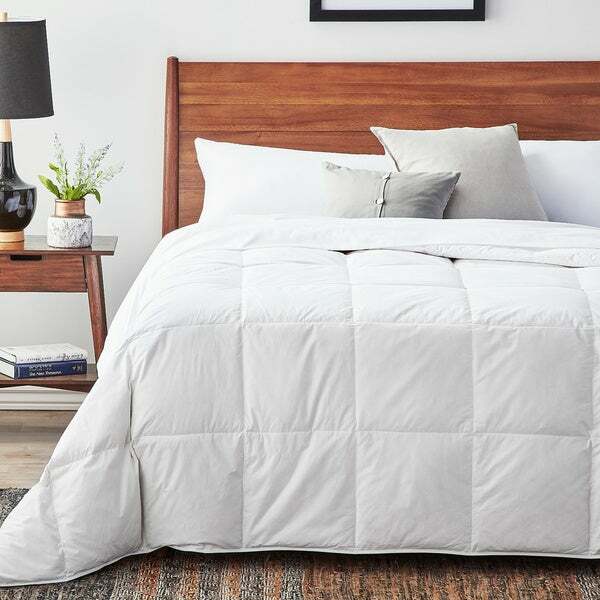 I love this comforter and would buy it again. Light weight but very warm! Highly recommend! Purchased this as a replacement for a medium-weight Down comforter that never provided the warmth promised. Well-constructed. A good value. Better than expected. Light and comfortable. This Down blend comforter is great. After reading the reviews and care instructions I made toe purchase and will say it is cozy, however not as fluffy as I would like. But in reading it needs time to fluff up. I read it needs to be fluffed in the dryer a few times. Especially after being sealed up extremely tight in the packaging. Not overly happy but not disappointed. As far as the fluff, only time will tell. Great comforter for the price. I thought it would be fluffier however it is acceptable as is. Love the size, first comforter to fit my bed adequately. This was a very slim comforter so I ended up returning it. I was able to find other comforters that provided more heat that were less expensive. While it did "puff up" a tiny bit, it really is quite flat (I thought this could be an issue, but decided to try it anyway). I really don't think it would keep us warm. Also, I didn't like the fact that the fill power and the thread count weren't listed. That's a bit sketchy. I even checked two other websites that sell this item, and no info was listed there, either. I gave it two stars because the baffle boxes are sewn all the way through, and the filling looked very evenly distributed - granted, that could shift with use, but I've purchased down comforters that were pretty messed up to begin with before. Overstock provided an excellent return procedure, as always. You win some, you lose some, but Overstock will remain my go-to for everything home-related! Purchased this comforter to add an extra layer of warmth to the bed. The item arrived quickly and fluffed right up. Great price for the quality. I love this duvet/comforter. It's just the right weight for year-round use. It's not super, super lofty when it comes to filling up the duvet but just enough, and it has those handy little hooks to which you can tie the duvet cover. The price is just right for what you get. This is a nice down blend comforter if you're looking to save money. Clean, crisp and cozy. I love the size of this comforter. It is cozy warm but not too hot. It's a little noisy. Besides that it's a great value for the price!! "Does this duvet insert have corner loops for ties ? If so how many on Cal king?" Hi there! This comforter has 8 built-in corner and side loops to secure your favorite duvet cover. Best. "what is the fill in ounces? a customer asked this question in 2015 and it remains unanswered. must know this information before buying. thanks. :â)"
Hello! Thank you for your question. This comforter has a microfiber down alternative fill of 300 gsm to provide the cozy comfort of down without the feathers, odor, and sharp quills. Best. exact size for Restoration Hardware duvet cover. "What's the fill in ounces? Is it a lightweight comforter?" Hello blond84, thank you for your inquiry. Unfortunately, the information you have requested is currently unavailable. You will receive an email notification once an answer is posted. Have a great day.